At its core, the Nintendo VR Kit is similar to previous versions of Labo. The full $80 kit comes with a new set of software and an assortment of cardboard models with step-by-step instructions designed to be used in tandem with the game. But by adding VR to the mix, it feels like Nintendo has really expanded the boundaries of its cardboard universe. This is the key model that makes everything work together. Just slip in the Switch, attach the headset to the Toy-Con you want to use, and that’s it. Here’s the Toy-Con Blaster in action. Having the Joy-Con’s analog stick act as the eye on the Toy-Con Bird is a nice touch. Each cardboard model has a specific game built to take advantage of its unique features. My favorite was the Toy-Con Blaster, which reminds me a lot of a re-imagined Super Scope from back in the 90s, where your goal is to blast cute little aliens as you travel through a shooting gallery. And while I didn’t have a chance to build the model myself, I was really impressed by the blaster’s sophisticated cocking mechanism that felt way more substantial than cardboard really should. It even comes with tactile feedback through clever use of rubber bands, and a surprisingly satisfying mechanical trigger. With the camera, the Joy-Con’s motion sensors are used to steer as you move your head, while the “lens” can be twisted to zoom in. You can also flick the analog stick to drop treats to attract fish. Painting and sculpting in 3D takes a little effort to wrap your mind around. But by far the most out there model is the Toy-Con Elephant, which is less of a traditional game and more of a modernized 3D take on Mario Paint. By moving your head and the elephant’s trunk, you can draw and sculpt in 3D, and potentially even take your creations and transfer them into the other section of the Labo VR Kit: The Labo Plaza and Garage. Thankfully, the fan on the Wind Pedal can be folded away when not in use to take up less space. At this point, I probably shouldn’t keep being surprised like this. But after barely more than an hour with the Labo VR Kit, I couldn’t help but find myself feeling like I had missed out being born in the 80s. 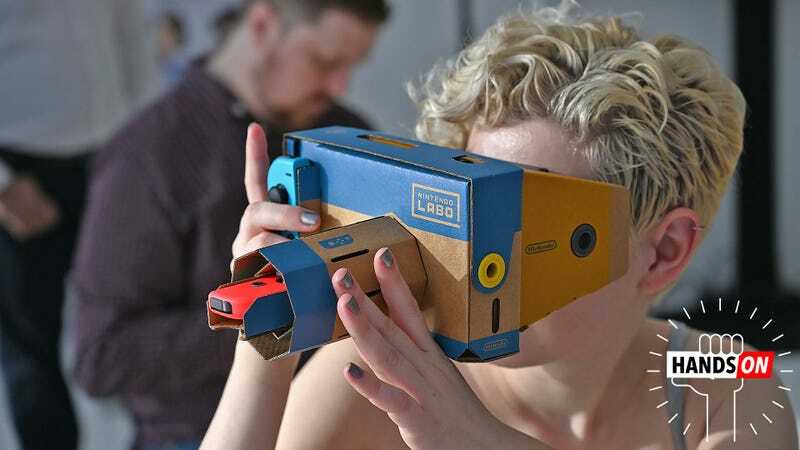 While it’s a bit more streamlined in scope, the Labo VR Kit revitalizes some of my favorite childhood gaming experiences like the Super Scope, Mario Paint, a hint of Pilotwings, the Virtual Boy, and more into a big bundle that made for 2019's technology. The Nintendo Labo VR Kit will be available on April 12th as a full kit for $80, or separately as a $40 starter kit offering the base game plus the blaster model, and two $20 add-on kits for the camera and elephant, and the bird and wind pedal.